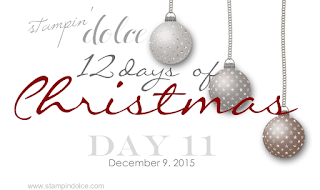 Welcome to day 11 of the Stampin' Dolce 12 days of Christmas. 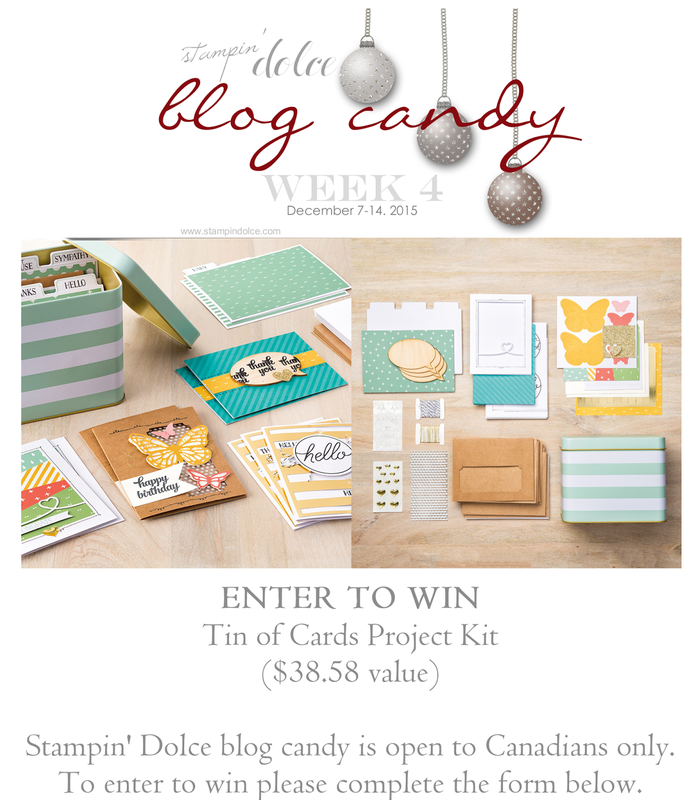 You may notice that I am a week late with my post ... Tis the season! I know that I am not alone when it comes to running out of time for things over the holidays. And I know that you are very forgiving and loyal followers! This is the last week of school and Christmas celebrating has already begun for us. I can simply say that I am human! I often get teased that I do not sleep. I often have people ask me how I do it all. Well this late post is evidence that I can not do it all! 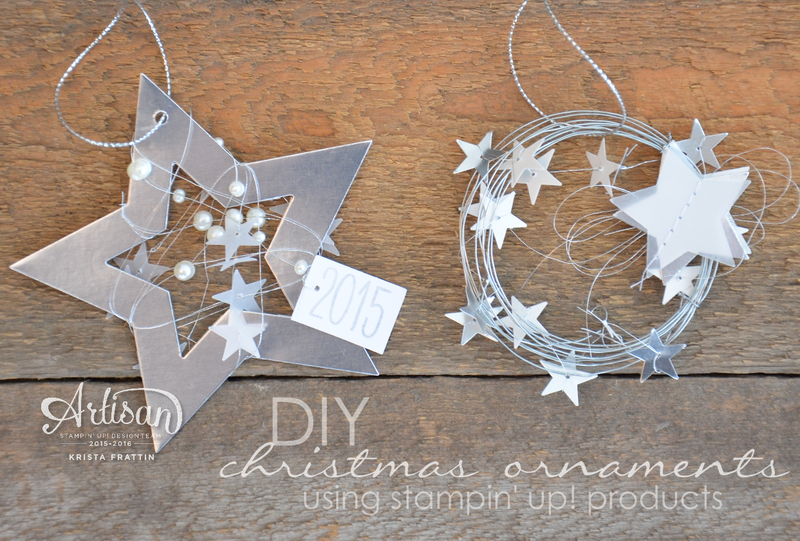 Today I have two DIY Christmas Tree ornaments for you. * Use the Big Shot and cut out two Stars in Silver Foil Sheets. You will need to adhesive the two stars back to back. This will allow the silver finish on both sides of the ornament. * Punch small stars in Vellum Cardstock. Thread Silver Metallic Thread with a needle and string vellum stars on the thread. * Add Pearl Basic Jewels to the threaded vellum stars. Sandwich these on the thread. * Wrap the threaded stars and pearls around the star. * Stamp "2015" on a piece of Whisper White cardstock with Smoky Slate ink. Use the 1" Square Punch to cut out the date. * Punch small stars in Vellum Cardstock and Silver Foil Sheets. Thread Silver Metallic Thread with a needle and string the stars on the thread. * Wrap silver crafting wire in a small wreath shape. Use a small piece of wire to hold the wreath together. * Wrap the strung stars around the wreath. * Punch a Medium Star in Vellum Cardstock and Silver Foil Sheet. Sew them together with a sewing machine. Stitch the star to the wreath. 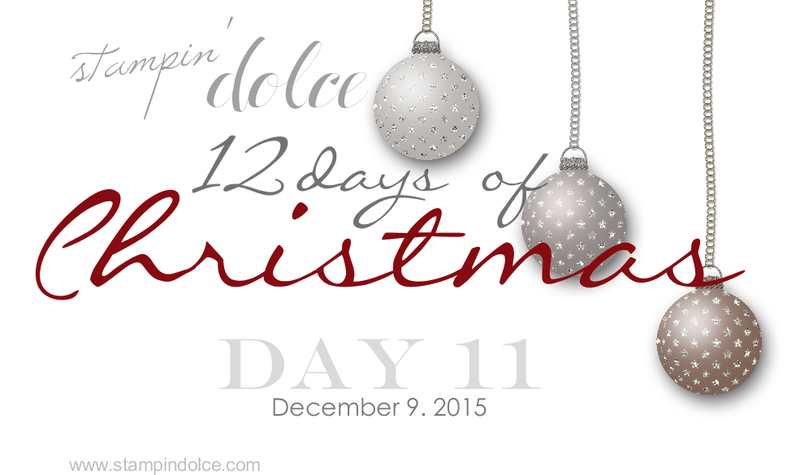 Be sure to come back later this week for day 12 of the Stampin' Dolce 12 days of Christmas! Have a creative day!